Tanval Indoril is the Grandmaster of House Indoril and leader of the Vanguard. He served alongside Holgunn in the Akaviri War. Tanval is present during many quests throughout Stonefalls. "Holgunn said you were reliable. I trust his instincts. And I know there is much work to do." Holgunn's told me about the siege. How can I help? "The Covenant closes on us like nix-hounds on a kill. They think they've already won the city. They're entirely wrong. They are doomed to the last man." "You are the plan. There's a relic beneath the city guarded by spirits of my ancestors. For me to fight them would be blasphemy, but you aren't of House Indoril. The entrance is through the tombs across the square. Bring the relic here." What can you tell me about the relic? "Only that you need to bring it. I tried to reason with my ancestors, but they do not understand our peril. You must succeed where I cannot." "Enter the tomb, retrieve the relic, and return to me." "Did you recover the relic?" I was attacked by an enraged spirit. He said you would destroy us all. "That was one of my ancestors. He refuses to recognize the threat facing us today. It's time to turn the tables on the Covenant. For that, you must buy me some time." Before the quest, Tanval Indoril will say: Tanval Indoril: "I need more time!" "I need time to prepare a ritual that will bring this to an end. We have to delay the Covenant troops to the south." How can I buy you some time? "With my ancestor's skull, I have a powerful weapon—the ultimate weapon! I just need a little more time." "Ask Holgunn. He's commanding the defense of the west gate. If you need a guide, speak to Garyn." "Go to the west gate and help Holgunn. Garyn can show the way." At the Indoril tomb, Tanval will be performing the ritual he was preparing for earlier. Tanval Indoril: "Heed my call... Balreth, I summon you!" Tanval Indoril: "Destroy the Covenant army!" Tanval Indoril: "You there! I will cloak you in shadow. Enter the portal and witness our victory." "You have brought credit to your house. This is a great thing. House Indoril will always speak well of your actions here today." "Our victory is complete. Even now, the Covenant retreats. You gave me enough time to summon Balreth. As grandmaster of House Indoril, I honor you." Tanval Indoril: "We must return Balreth to its slumber"
"Balreth has done its job. The Covenant has been driven from Davon's Watch! Now to put it back where it belongs: in the depths of Ash Mountain." "I'm not exactly sure. I made us of ancient rites and secret lore to wrench him from his cell. You saw the conclusion of my efforts. My able son Garyn even now works to return him to his slumber. He will guide your hand." "You'll find Garyn west of the city, on the slopes of Ash Mountain. I sent a detachment of soldiers with him to ensure his safety. I'm certain he already knows what needs to be done." I'll report to Garyn, then. "You've done well here, soldier. You're a credit to the Pact. I'm certain you'll be of use to my son." Can you tell me more about Balreth? "Balreth is one of two ancient magical juggernauts, the Brothers of Strife. Their story is too long to tell now. It is enough that Balreth is a powerful weapon at our command." You can find him inside the manor at Ebonheart alongside his son Garyn, Walks-in-Ash and Holgunn. He is not instrumental to the quest, but you can speak with him. "Vivec guide your steps, soldier." "We're holding them. In some places, we're barely holding on, but we're holding them. But I wish I hadn't invoked the Brother of Strife." "I do. I wish I hadn't been needed here. I should have aided the effort at Ash Mountain. The Brothers depend on old magic from another time. They have no place in Stonefalls today." Tanval appears at the end of the quest, after the Pact retakes the courtyard at Fort Virak. Speak with him to end the quest and start the next one. "The yard is secure. Once again, the Pact controls Fort Virak. Yet General Serien still lives. Where is he? He has much to answer for." General Serien is in the keep. He's turning soldiers into zombies. "That Covenant general is a monster. Thank you, soldier. We'll ensure the dead rest peacefully." "The courtyard is ours. Now all that remains is to cut off the snake's head." I'm ready to finish this. "We can't let General Serien finish his ritual. Garyn and I are ready to dispel his wards. Get ready for a fight, soldier." What will I face beyond the gate? "You'll face the dead. I don't know how he's doing it, but Serien has transformed our warriors into undead slaves. Once the ward is down, enter the gate. Make your way to the keep and confront General Serien. We'll join you as soon as we can." I'll put an end to General Serien. "All right, the ward is down. That was harder than I thought. We're right behind you. Get in there!" Tanval Indoril: "The courtyard is ours!" 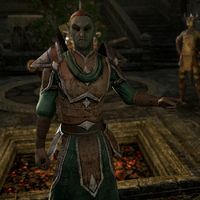 After General Serien's death, Garyn Indoril is killed. Tanval is distraught, and steals the Coral Heart from Holgunn before fleeing. Garyn Indoril: "We've done it! The general is dead!" General Serien: "No! I must not fail!" The General then kills Garyn in a last-ditch effort to take something from the Pact. Tanval Indoril: "Not Garyn! Not Garyn!" Tanval Indoril: "The Daggerfall Covenant took my son!" Holgunn: "Tanval, no! The Coral Heart is too powerful." Tanval Indoril: "No, Holgunn. The Covenant must pay!" You will find Tanval injured on the ground, being tended to by Walks-in-Ash high within the Spire. "My friend. I see you've come to stop me. Thank Vivec you're here." How were you wounded, Tanval? We failed. I'm lucky to be alive." You can't unleash Sadal on Stonefalls. It's madness. "I know that now. Sadal summoned the Daedra the moment we arrived. Even with the artifact, I can't control him." How do we get to Sadal? "One final ward remains. Your key won't work. To disable the ward, you'll need to slay an ancient gatekeeper lurking in the caldera. Summon her at the ritual bowl below us. And listen: I'm sorry, my friend." "The gatekeeper is the only thing standing in our way." Why did you do it, Tanval? "You know why, my friend. The death of my son, Garyn. I couldn't bear it. Vivec knows, when I was younger, I had trouble with my anger. It still plagues me." I thought you understood after what happened with Balreth. "Yes, I should have known. The destruction near Davon's Watch, my dishonorable orders to the Vanguard, my shame at Fort Virak ... I will never be able to atone. "With the final ward down, the way is clear. Fortunately, Walks-in-Ash has restored some measure of my strength." "Yes, by Vivec! Sadal is trapped between this realm and Oblivion. With the final ward down, his prison is vulnerable. Now we can strike. We'll undo the mistakes of House Indoril." "The mages who first imprisoned Sadal linger here. The portal to Sadal's realm will not open without their aid. I believe they are angry with me." How do we placate these spirits? "Speak with them, my friend. Perhaps you can earn their trust. One awaits you on the platform in the center of the caldera. I'll speak to the spirits. "I brought this threat about. I know that now. I hope I can help stop it before it's too late." "It's amazing what you've been able to accomplish." After the portal is open, Tanval and company appear. Speak to Tanval to end this quest and begin the next. "You've done it! By the Three, you've done it!" "Holgunn, Walks-in-Ash, the Vanguard, and myself. We'll follow you to Oblivion and beyond. Garyn trusted you. I only wish I had done the same." "A word with you before we enter the portal." If I can do it, I will. I'll tell him, Tanval. Now let's see this done. "Let's enter the portal. I long to be done with this." From here on out, most of Tanval's dialogue is through conversations in the world as opposed to sharing face-to-face dialogue with the player. Tanval Indoril: "Hold the portal. We don't want to be trapped here." Walks-in-Ash: "Those poor creatures. May their souls find soft mud-wallows." Another ward blocks you path. Tanval speaks again once the ward is down. Tanval Indoril: "Looks like it's just us. Stay close." Tanval instructs you to stay out of Sadal's fire as he takes down the beast's protections. 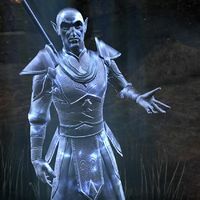 After Sadal is defeated and you've spoken with Walks-in-Ash back on Tamriel, Tanval's spirit appears outside the entrance to the Tormented Spire. This page was last modified on 11 March 2019, at 01:34.